Technology is changing every aspect of the entertainment industry. On November 2nd, the USC School of Cinematic Arts’ Sound Department, and the John C. Hench Division of Animation and Digital Arts Professor Richard Weinberg took a major leap forward in remote collaboration when they hosted a master class with Oscar-winning sound designer Randy Thom. Unlike other classes at the School, Thom taught the class remotely from Skywalker Ranch in northern California. 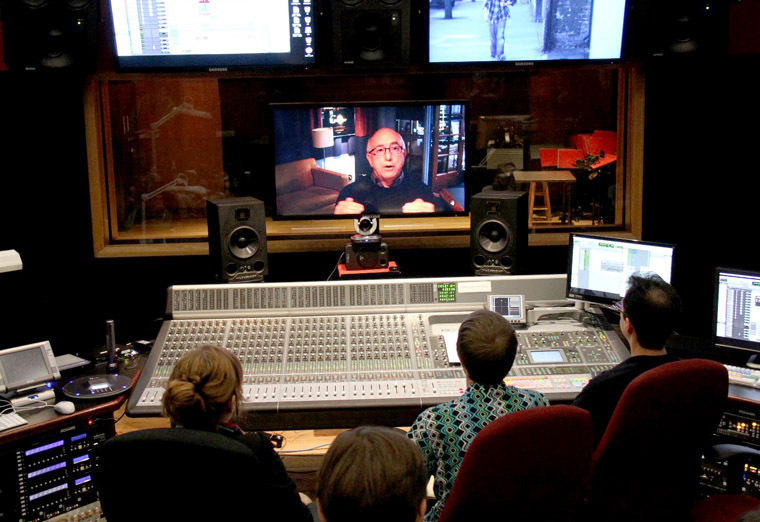 Tom and the students' projects were streamed live in HD into the sound production suite in the Cinematic Arts Complex via CineGrid Networks. Prior to the class, Pro Tools sessions and Quicktime movies from four USC student films were sent to Skywalker Sound over the network. Thom, who won Academy Awards for The Right Stuff and The Incredibles, reviewed these projects from his sound design studio at Skywalker Sound and gave the sound crews, who were in SCA's Sound Production Suite, real-time remote mentoring with an emphasis on sound design and mixing techniques. Associate Professor Midge Costin, who hosted the class and arranged Randy Thom's participation, said, "To get detailed, creative feedback on their sound designs from a sound god such as Randy Thom is invaluable for the students. It is a semester-worth of information, let alone a memory for a lifetime!" Weinberg leads the School's CineGrid efforts, and added, "The CineGrid family of high speed networks for digital media research collaboration, with Lucasfilm and the USC School of Cinematic Arts as CINEGRID founding members, was utilized to provide connectivity between USC and Skywalker Sound. The class demonstrated how effective remote mentoring in sound production can be with high definition video, 5.1 channel surround sound, interactive remote control of Pro Tools and high quality video conferencing, all bringing together one of the industry's leaders with USC students." Brian Long, Skywalker Sound Engineering and SCA MFA ’05, along with Bahui Yang, SCA MFA ’12, provided technical coordination for the session at Skywalker Sound. This master class was the second remotely conducted class with Skywalker Sound, this time utilizing the Sound Production Suite in the SCB building. The USC Sound Department plans future collaborations in the distant learning field to promote collaborations between students and industry professionals. The four films reviewed by Thom are current, advanced projects at the School of Cinematic Arts. The directors and producers work in the advanced sound production facilities at the School and are aided by students dedicated to the study of sound production and design.